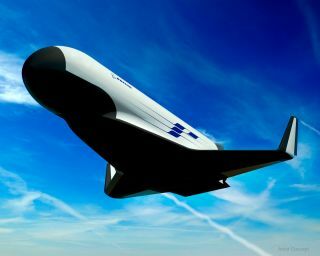 This artist's illustration shows one possible Boeing design for the U.S. military's XS-1 Experimental Spaceplane concept. The U.S. Defense Advanced Research Projects Agency (DARPA) is now entering the second and third phases of its ambitious Experimental Spaceplane (XS-1) program, which aims to make launching satellites a daily occurrence. "I can tell you officially now that we have been funded by the [Obama] Administration for the next phase of XS-1," DARPA's Jess Sponable told applauding attendees at the Space Access '16 Conference in Phoenix last week. "What I can tell you right now is that we have $146 million." Over the past two years, DARPA has funded Phase 1 studies by three companies: Boeing, which partnered with Blue Origin; Masten Space Systems, which partnered with XCOR Aerospace; and Northrop Grumman, which partnered with Virgin Galactic. The goal of the next phases of the program is to take the program beyond studies to flight tests. The solicitation will be open to all companies, not just the ones that were funded in Phase 1. Sponable said that although he expects more than three bids, the level of detail required for the next phases will make it difficult for new entrants to compete with the companies that are already in the program. DARPA will kick off Phase 2 with a proposers' day on April 29 in Arlington, Virginia. The agency will send out a solicitation following the meeting, with the goal of selecting a single contractor early in fiscal year 2017. Flights of the vehicle would occur in the 2019 to 2020 time frame. Sponable said that the $146 million DARPA has received is sufficient to begin to support a single contractor. "That's enough to pick someone and go," he said. "It's probably not enough to fully fund what we have envisioned." Bidders will be required to bring their own funding to the table as part of a public-private partnership, Sponable said. The days of the federal government fully funding development programs is over, he added. The initial version of the launch vehicle must be capable of placing a 900-lb. (408 kilograms) payload into low Earth orbit. The contractor will need to show how the vehicle can be upgraded to carry 3,000-lb. (1,360 kg) payloads in commercial operations using an expendable upper stage. Sponable said that a number of companies are working on small-satellite launch vehicles, whose engines might be used as an upper stage on the XS-1. A low-cost, reusable launch vehicle capable of flying every day would have numerous military and commercial applications, he added. The military would be able to disaggregate its large satellites into smaller constellations and be able to rapidly and affordably replace spacecraft that failed or were taken out by enemy action. The emerging commercial small-satellite market is projected to require hundreds of XS-1-class launches annually, Sponable said. Artist's concept of the space plane being designed by Northrop Grumman, with help from Scaled Composites and Virgin Galactic, for DARPA's XS-1 program. He acknowledged that previous government efforts at producing low-cost launchers have fallen significantly short of the mark. "This is not new," he admitted. "We've been pursuing this low-cost, aircraftlike access to space literally since the 1960s, and seriously since the 1980s. And we've had failure after failure after failure." Past efforts have been handicapped by a combination of lofty goals and immature technology at low levels of development, Sponable said. Today, the various technologies needed for low-cost launch are much more mature, giving XS-1 a greater chance at success.